Oklahoma’s Baker Mayfield became the third Sooner player ever to claim the nation’s oldest and most prestigious quarterback trophy, joining Jason White (2003-04) and Sam Bradford (2008). The Austin, Texas, product is the eighth quarterback winner to star as a prep in O’Brien’s home state of Texas. Mayfield finished the year 285-for-404 passing for 4,627 yards and 43 touchdowns, and also rushed for 311 yards and five scores. His single-season passing efficiency rating of 198.9 broke his own all-time NCAA record. He led the nation in passing efficiency (198.9), points responsible for (296), completion percentage (.705) and yards per pass attempt (11.5). 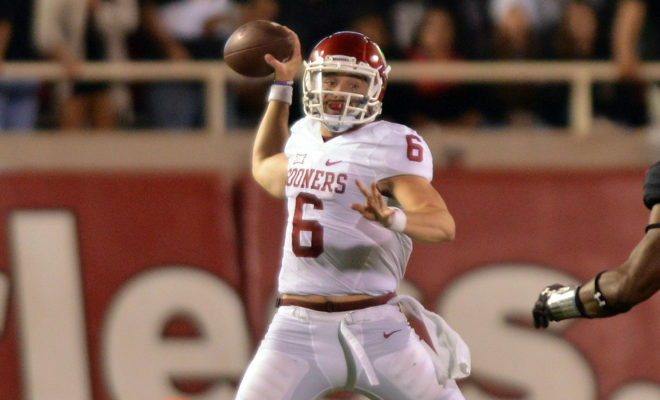 Mayfield also ranked among the NCAA’s top five in passing yards (2nd, 4,627), passing touchdowns (2nd, 43), total quarterback rating (92.6) and total offense (5th, 352.7). In 2017, the senior threw for more than 300 yards eight times, including a school record total of 598 against Oklahoma State. Mayfield also had at least three touchdown strikes in 10 games, including a season-best five against the instate rival Cowboys. The Big 12 champion Sooners finished with a 12-2 record and earned a berth in the College Football Playoff. In the Big 12 Championship Game against TCU, Mayfield completed 15-of-23 passes for 243 yards, four touchdowns and no interceptions. He also added 65 yards rushing on just six carries, and was named the game’s Most Outstanding Player.